Step inside this travel trailer that features a private bunkhouse, triple slides, and a kitchen island and you won't want to leave. After a day of hiking or biking, you can come back to this unit and clean up in the full bath that includes a shower skylight, then either start dinner inside on the three burner range, or outside on the camp kitchen. The private bunkhouse with a slide out can sleep four kids or guest and you'll find additional sleeping space on the dinette and sofa once folded down. The private front bedroom with a queen bed will provide a good night's rest. 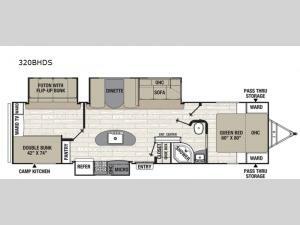 This travel trailer also features a closet just as you enter the unit to hang your jackets and put your shoes away.